Ruirui Sun, Ph.D., Zeynal Karaca, Ph.D., and Herbert S. Wong, Ph.D. This Healthcare Cost and Utilization Project (HCUP) Statistical Brief presents trends in hospital-affiliated ED utilization by examining the population rate of ED visits and the number of ED visits across primary payers by age groups. The Nationwide Emergency Department Sample (NEDS) from 2006 to 2015 was used to generate national estimates of ED visits and patient characteristics. Trends of hospital-affiliated ED visits are presented by age group, first overall and by expected primary payer. Figure 1 presents the national rate of hospital-affiliated ED visits, per 100,000 population by age group, from 2006 to 2015. Information presented here includes all types of ED visits. The rate of ED visits per 100,000 population reached a 10-year high in 2015 for all age groups and increased the most for patients aged 45-64 years (20 percent, from 2006). The proportion of ED visits that resulted in hospital admission decreased for all age groups from 2006 to 2015. For patients aged under 18 years, the share of ED visits with Medicaid as the primary payer rose from 45 percent in 2006 to 62 percent in 2015. The share of Medicaid among ED visits for those aged 18-44 and 45-64 years rose with average annual increase of 11 and 14 percent, respectively, from 2013 to 2015, compared with 4 percent increase for both age groups from 2006 to 2013. The share of uninsured ED visits for those aged 18-44 and 45-64 years dropped with average annual decrease of 17 and 21 percent, respectively, from 2013 to 2015, compared with 0 and 2 percent increase, respectively, from 2006 to 2013. For patients under the age of 65 years, the share of ED visits covered by private insurance decreased from 2006 to 2015 and changed the most for patients under age 18 years (average annual decrease of 4 percent). For those aged 65 years and older, Medicare and private insurance accounted for 95 to 96 percent of all ED visits. Line graph that shows the rate of emergency department visits per 100,000 population from 2006 to 2015 by age. 65+ years: fluctuated between 54,371 and 55,092 between 2006 and 2011; dropped to 53,537 in 2012; rose to 54,619 in 2013; dropped to 53,833 in 2014; rose to 56,803 in 2015. 18-44 years: increased steadily from 43,252 in 2006 to 46,301 in 2010; fluctuated between 45,518 in 2011 and 47,022 in 2015. <18 years: 2006: 35,823; 2007: 36,413; 2008: 35,656; 2009: 38,325; 2010: 34,419; 2011: 36,549; 2012: 37,822; 2013: 36,143; 2014: 35,704; 2015: 38,552. 45-64 years: rose steadily from 33,042 in 2006 to 39,757 in 2015. 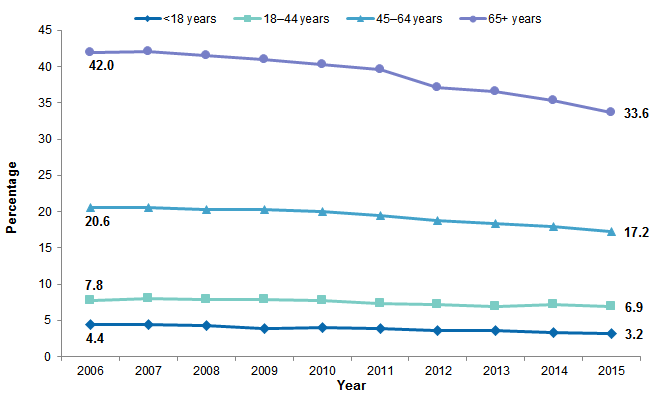 ED visit rates reached a 10-year high for all age groups in 2015, with patients aged 45-64 years having the largest percentage increase from 2006 to 2015. For patients aged 65 years and older, the ED visit rate per 100,000 population was higher than that for the other age groups each year. The rate fluctuated between 53,537 and 55,092 from 2006 to 2014, and in 2015, the rate reached 56,803. For patients aged 18-44 years, the ED visit rate per 100,000 population was the second highest of all age groups each year. It increased by 9 percent, from 43,252 in 2006 to 47,022 in 2015. The ED visit rate per 100,000 population for patients aged 45-64 years was 33,042 in 2006, the lowest among all age groups. The ED visit rate increased over time and in 2015, it reached 39,757 per 100,000, a 10-year high and an increase of 20 percent from 2006. For patients under 18 years of age, the rate of ED visits per 100,000 population fluctuated between approximately 34,400 and 38,600 and reached its highest level of 38,552 in 2015. Among patients who visit EDs, some may be admitted to the same hospital. Figure 2 presents the percentage of ED visits that resulted in hospital admission, by age group from 2006 to 2015. Information presented here excludes patients who visited the ED and then were discharged without hospital admission. Line graph that shows the percentage of emergency department visits from 2006 to 2015 that resulted in hospital admission by age. 65+ years: increased from 42.0 in 2006 to 42.1 in 2007; decreased steadily to 33.6 in 2015. 45-64 years: 20.6 in 2006 and 2007; then decreased steadily to 17.2 in 2015. 18-44 years: rose from 7.8 in 2006 to 8.0 in 2007; decreased steadily to 7.0 in 2013; rose to 7.3 in 2014; dropped to 6.9 in 2015. <18 years: 2006: 4.4; 2007: 4.5; 2008: 4.4; 2009: 3.8; 2010: 4.0; decreased steadily to 3.2 in 2015. From 2006 to 2015, the percentage of ED visits that resulted in hospital admission dropped for all age groups. In 2006, 42.0 percent of ED visits resulted in hospital admission among those aged 65 years and older. By 2015, this number had dropped to 33.6 percent, a decrease of 20 percent from 2006. Among patients aged 45-64 years, the percentage of ED visits resulting in hospital admission decreased from 20.6 in 2006 to 17.2 in 2015, for a decrease of 17 percent. Among patients aged 18-44 years, the percentage of ED visits resulting in hospital admission decreased from 7.8 in 2006 to 6.9 in 2015, for a decrease of 12 percent. Among patients aged under 18 years, the percentage of ED visits followed by hospital admission decreased from 4.4 in 2006 to 3.2 in 2015, for a decrease of 27 percent. In this section, changes in ED visits within each age group are examined. Specifically, Figures 3 to 6 present trends in primary payer for each age group from 2006 to 2015. Note: Shares of "Missing" and "Other" payers are not presented. Line graph that shows the share of emergency department visits by patients <18 years between 2006 and 2015 by primary payer. Medicaid: dropped from 44.9 in 2006 to 43.1 in 2007; then increased steadily to 62.0 in 2014 and 2015. Private insurance: increased from 40.6 in 2006 to 41.2 in 2007; decreased steadily to 27.6 in 2014; increased to 28.1 in 2015. Uninsured: increased from 9.4 in 2006 to 11.2 in 2007; decreased steadily to 6.9 in 2011; increased to 7.8 in 2012; decreased steadily to 6.1 in 2016. Medicare: 2006: 0.2; 2007: 0.4; 2008: 0.3; 2009: 0.2; 2010: 0.3; 2011: 0.5; 2012: 0.5; 2013: 0.3; 2014: 0.4; 2015: 0.6. For patients aged under 18 years, Medicaid was the most common payer type among all ED visits every year, and its share increased over time. The share of ED visits with Medicaid as the primary payer among patient aged under 18 years increased from 44.9 percent in 2006 to 62.0 percent in 2015, an average annual increase of 4 percent. Private insurance had the second largest share within this age group; its share dropped from 40.6 percent in 2006 to 27.6 percent in 2014 and increased slightly to 28.1 percent in 2015, an average annual decrease of 4 percent over the 10-year period. The share of uninsured ED visits for patients under the age of 18 years was 9.4 percent in 2006, reached its highest point in 2007 (11.2 percent), and decreased in the following years. In 2015, the share of uninsured ED visits for this age group reached a 10-year low of 6.1 percent. The share of Medicare ED visits was 0.6 percent or less from 2006 to 2015. Line graph that shows the share of emergency department visits by patients 18-44 years between 2006 and 2015 by primary payer. Private insurance: rose from 37.0 in 2006 to 37.2 in 2007; decreased steadily to 29.9 in 2012; increased steadily to 32.6 in 2015. Uninsured: 2006: 28.7; 2007: 30.0; 2008: 28.8; 2009: 28.7; 2010: 29.4; 2011: 27.6; 2012: 28.5; 2013: 28.9; 2014: 23.0; 2015: 19.9. Medicaid: dropped from 22.2 in 2006 to 21.6 in 2007; increased steadily to 36.3 in 2015. Medicare: increased from 4.5 in 2006 and 2007 to 4.7 in 2008; dropped to 4.6 in 2009; increased to 4.8 in 2010; fluctuated between 5.2 and 5.3 from 2011 to 2015. For patients aged 18-44 years, private insurance was the most common primary payer among all ED visits from 2006 to 2013. In 2006, private insurance was the most common primary payer among patients aged 18-44 years, covering 37.0 percent of the ED visits. At the same time, uninsured ED visits accounted for 28.7 percent and Medicaid accounted for 22.2 percent of ED visits in this age group. 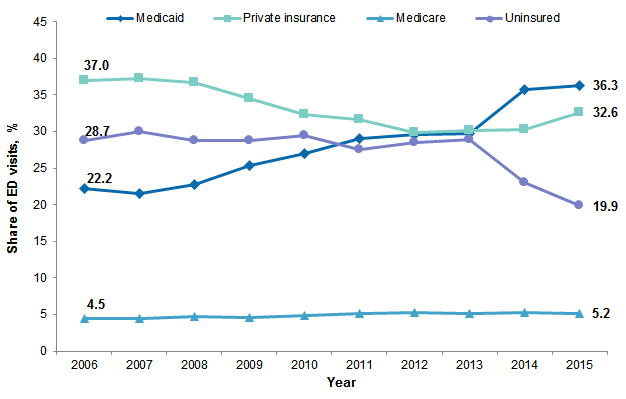 Over time, until 2013, the share of private insurance decreased, the share of Medicaid increased, and the share of uninsured visits remained the same (29 to 30 percent). By 2013, the percentage of ED visits among patients aged 18-44 years covered by the three payers was similar (28.9-30.1 percent). For patients aged 18-44 years, from 2013 to 2015 the share of ED visits with Medicaid as the primary payer increased by 22 percent and the share of uninsured ED visits decreased by 31 percent. From 2013 to 2015, the share of ED visits with Medicaid as the primary payer increased from 29.7 to 36.3 percent—an average annual increase of 11 percent, compared with average annual increase of 4 percent from 2006 to 2013. The share of uninsured ED visits dropped to its lowest level of 19.9 percent in 2015, an average annual decrease of 17 percent from 2013 (it stayed relatively constant from 2006 to 2013). The share of ED visits covered by private insurance reached 32.6 percent in 2015, with an average annual decrease of 1 percent over the 10-year period. The share of ED visits covered by Medicare rose from 4.5 percent in 2006 to 5.2 percent in 2015, an average annual increase of 2 percent. Line graph that shows the share of emergency department visits by patients 45-64 years between 2006 and 2015 by primary payer. 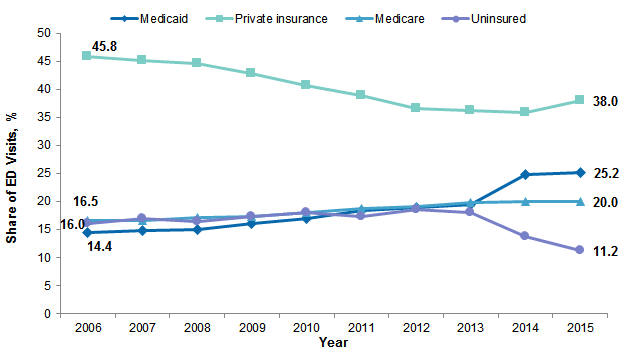 Private insurance: decreased steadily from 45.8 in 2006 to 35.8 in 2014; increased to 38.0 in 2015. Medicare: increased steadily from 16.5 in 2006 to 20.0 in 2014 and 2015. Uninsured: 2006: 16.0; 2007: 17.0; 2008: 16.5; 2009: 17.3; 2010: 18.0; 2011: 17.3; 2012: 18.5; 2013: 18.1; 2014: 13.7; 2015: 11.2. 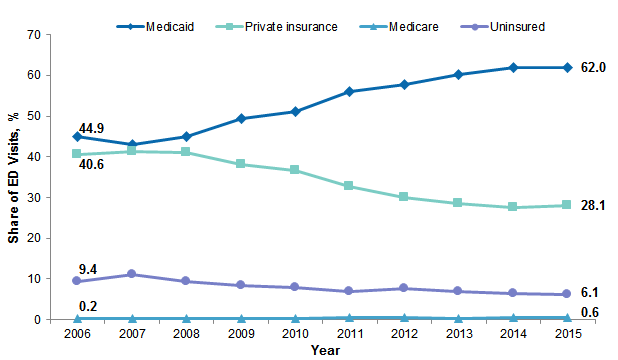 Medicaid: increased steadily from 14.4 in 2006 to 25.2 in 2015. For patients aged 45-64 years, private insurance was the most common primary payer among all ED visits every year; however, its share decreased from 2006 to 2014. In 2006, private insurance was the primary payer for 45.8 percent of ED visits among patients aged 45-64 years. This number decreased to 35.8 percent in 2014 and increased slightly to 38.0 percent in 2015—an average annual decrease of 2 percent from 2006. For patients aged 45-64 years, from 2013 to 2015 the share of ED visits with Medicaid as the primary payer increased by 29 percent and the share of uninsured ED visits decreased by 38 percent. In 2006, Medicaid had the lowest share among all four payers within this age group (14.4 percent). Its share increased to 19.4 percent in 2013 and further increased to 25.2 percent in 2015—an average annual increase of 14 percent from 2013 to 2015 (compared with average annual increase of 4 percent from 2006 to 2013). The share of uninsured ED visits increased from 16.0 percent in 2006 to 18.1 percent in 2013, and then dropped to a 10-year low (11.2 percent) in 2015—an average annual decrease of 21 percent from 2013 (compared with average annual 2 percent increase from 2006 to 2013). The share of uninsured ED visits was the lowest among all payers from 2011 to 2015. The share of ED visits Medicaid fluctuated between 1.4 and 1.8 percent, and the share of uninsured visits remained under 2 percent during the 10-year time period. Notes: Shares of "Missing" and "Other" payers are not presented. Medicare, Medicaid, or private insurance cover the majority of Americans aged 65 years and older. Those who do not have any coverage may not potentially be U.S. citizens or permanent residents. Line graph that shows the share of emergency department visits by patients 65+ years between 2006 and 2015 by primary payer. Medicare: dropped from 88.6 in 2006 to 86.3 in 2007; increased steadily to 88.0 in 2012; decreased steadily to 87.1 in 2015. Private insurance: increased steadily from 7.3 in 2006 to 9.7 in 2009; decreased steadily to 7.9 in 2012; increased steadily to 8.5 in 2014; decreased to 8.4 in 2015. Medicaid: increased steadily from 1.4 in 2006 to 1.7 in 2012; decreased to 1.4 in 2013; increased to 1.8 in 2014; decreased to 1.7 in 2015. Uninsured: increased from 1.3 in 2006 to 1.9 in 2007; decreased to 1.2 in 2008 and 2009; increased to 1.3 in 2010; decreased to 1.0 in 2011; dropped to 1.1 in 2012, 2013, and 2014; increased to 1.2 in 2015. For patients aged 65 years and older, Medicare and private insurance accounted for 95 to 96 percent of all ED visits. The share of ED visits with primary payer of Medicare among patients aged 65 years and older fluctuated between 86.3 to 88.6 percent. The share of privately insured ED visits fluctuated between 7.3 and 9.7 percent. Together Medicare and private insurance accounted for 95 to 96 percent of all ED visits within this age group. 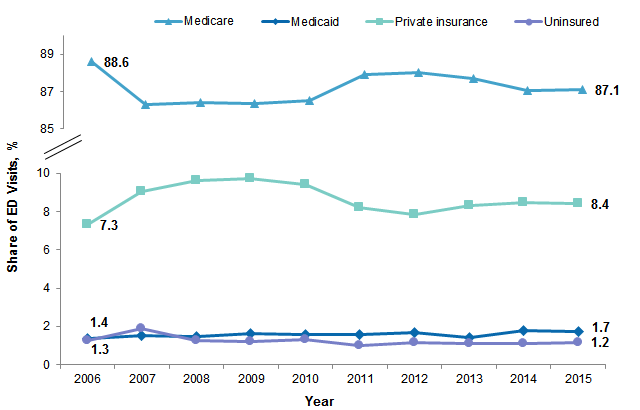 To summarize across age groups, for patients aged 64 years or younger, the share of all ED visits with private insurance as the expected primary payer decreased from 2006 to 2014 and increased from 2014 to 2015. The share of ED visits with primary payer of Medicaid increased for these age groups, and the share of uninsured ED visits dropped to its 10-year low in 2015. For patients aged 18-64 years, the share of ED visits with Medicare as the primary payer increased during the 10-year period. For this Statistical Brief, when more than one payer is listed for an ED visit, the first-listed payer is used. The HCUP Nationwide Emergency Department Sample (NEDS) is a unique and powerful database that yields national estimates of emergency department (ED) visits. The NEDS was constructed using records from both the HCUP State Emergency Department Databases (SEDD) and the State Inpatient Databases (SID). The SEDD capture information on ED visits that do not result in an admission (i.e., patients who were treated in the ED and then released from the ED, or patients who were transferred to another hospital); the SID contain information on patients initially seen in the ED and then admitted to the same hospital. The NEDS was created to enable analyses of ED utilization patterns and support public health professionals, administrators, policymakers, and clinicians in their decision making regarding this critical source of care. The NEDS is produced annually beginning in 2006. Over time, the sampling frame for the NEDS has changed; thus, the number of States contributing to the NEDS varies from year to year. The NEDS is intended for national estimates only; no State-level estimates can be produced. For other information on ED visits in the United States, refer to the HCUP Statistical Briefs located at www.hcup-us.ahrq.gov/reports/statbriefs/sb_ed.jsp. Agency for Healthcare Research and Quality. Overview of the Nationwide Emergency Department Sample (NEDS). Healthcare Cost and Utilization Project (HCUP). Rockville, MD: Agency for Healthcare Research and Quality. Updated December 2016. www.hcup-us.ahrq.gov/nedsdoverview.jsp. Accessed January 31, 2017. Sun R (AHRQ), Karaca Z (AHRQ), Wong HS (AHRQ). 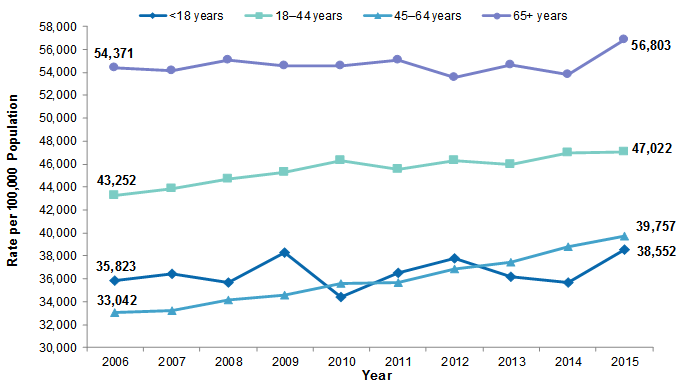 Trends in Hospital Emergency Department Visits by Age and Payer, 2006â€“2015. HCUP Statistical Brief #238. March 2018. Agency for Healthcare Research and Quality, Rockville, MD. www.hcup-us.ahrq.gov/reports/statbriefs/sb238-Emergency-Department-Age-Payer-2006-2015.pdf. This Statistical Brief was posted online on March 27, 2018. 1 Fields WW, Asplin BR, Larkin GL, Marco CA, Johnson LA, Yeh C, et al. The Emergency Medical Treatment and Labor Act as a federal health care safety net program. Academic Emergency Medicine. 2001;8(11):1064-9. 2 Morganti KG, Bauhoff S, Blanchard JC, Abir M, Iyer N, Smith AC, et al. The evolving role of emergency departments in the United States. Rand Health Quarterly. 2013;3(2):3. 4 Bernstein AB, Hing E, Moss AJ, Allen KF, Siller AB, Tiggle RB. Health care in America: Trends in utilization. Hyattsville, MD: National Center for Health Statistics. 2003. www.cdc.gov/nchs/data/misc/healthcare.pdf. Accessed January 30, 2018. 5 Tang N, Stein J, Hsia RY, Maselli JH, Gonzales R. Trends and characteristics of US emergency department visits, 1997-2007. JAMA. 2010;304(6):664-70. 6 Centers for Disease Control and Prevention, National Center for Health Statistics. Health, United States, 2012: With Special Feature on Emergency Care. Hyattsville, MD: National Center for Health Statistics; 2013. 7 Pines JM, Zocchi M, Moghtaderi A, Black B, Farmer S, Hufstetler G, et al. Medicaid Expansion in 2014 did not increase emergency department use but did change insurance payer mix. Health Affairs. 2016;35(8):1480-6. 8 Sabik LM, Cunningham PJ, Tehrani AB. Changes in emergency department utilization after early Medicaid expansion in California. Medical Care. 2017;55(6):576-82. 9 Barrett M, Coffey R, Levit K. Population Denominator Data for Use With the HCUP Databases (Updated With 2016 Population Data) HCUP Methods Series Report # 2017-04 ONLINE. October 17, 2017. U.S. Agency for Healthcare Research and Quality. www.hcup-us.ahrq.gov/reports/methods/2017-04.pdf. Accessed November 22, 2017. Internet Citation: Statistical Brief #238. Healthcare Cost and Utilization Project (HCUP). March 2018. Agency for Healthcare Research and Quality, Rockville, MD. www.hcup-us.ahrq.gov/reports/statbriefs/sb238-Emergency-Department-Age-Payer-2006-2015.jsp.